I wrote earlier about my use of land masks to sharpen up the boundaries of the ERSST data set that I use (and stop SST grid centres turning up on land). I have a more ambitious use in improving the weighting of the TempLS triangular mesh for land/sea difference. At present, many elements have mixed land/sea, and it is largely left to chance to get he balance right. I think that usually works out, but it would be better to have control. A land mask is a big matrix of 1's and 0's corresponding to a grid, usually lat/lon. It has 1 if the cell is in land; it may also have a % where there is doubt, or may have a binary choice. There are a lot of land masks around, down to kilometer resolution if you want, but common ones are 1°, 1.2 and 1/4. That is what I will use (as used in the ISLSCP 2 project). My general scheme is to refine the mesh to reduce the area of those spanning triangles. New nodes don't have new data attached, but their weight will be attributed to a land or sea station according to their placement. I found that I would really like a more advanced mask, that actually gave a measure of the distance to the coast (for land and sea). It doesn't really increase the size of the mask. And it means that when I want to create a new node, I can place it toward the coast, instead of waiting for successive node generation to locate it. My scheme without this worked well for a while, but would create situations where new nodes would force a shift in some triangle that had all nodes on land. This happens because each mesh update is by convex hull formation, and with new nodes such a triangle might lose its tangent status. So I set about making such a mask. I use a diffusion scheme. I mark the cells where land and sea adjoin, scored zero. Then next step I mark every neighbor cell on the land side +1, and on sea, -1. Then I mark their neighbors +2, -2, and so on. But there is the problem of lakes. Masks generally show a lot of them, and I don't really want to know the distance to the nearest lake. So I first remove them. I do this by diffusion too. At this stage, I have the original 0,1 mask. I first advance the land by marking each of the 1 cells with a 1, and then again. That fills in most lakes, but also a lot of sea, especially bays etc. So then I diffuse back, advancing the 0's. This won't help the inland lakes, but will restore the sea cells to 0. Then I use the original mask to restore all land to 1 status. I'll show below how this all works. It has enabled the overall aim, a coast-hugging triangular mesh, which I'll show in my next post. I have put the results as a R data file here. It is a list "mask"; the components are a letter (q for original, a for lake-less, and n with dist to sea), and 1,2,4 for cells per degree. I've been intermittently tracking the progress of this review, which seems to have zombie status. The web site is still there, with no sign of news or termination. The project itself was announced here, with banner headlines in the Telegraph ( "Top Scientists Start To Examine Fiddled Global Warming Figures" ) and echoes. I described the state of play in September 2015. I posted on the previous anniversary. I thought it necessary to maintain a watch, because they had said that despite not proceeding to a report, papers would be written, including one on the submissions. Publication of those would be held back until then. But Sept 2015 was the last news posting, and I have not heard of any progress with papers. This is probably my last post on the topic - I think we have to deem it totally dead, despite the GWPF website still promising progress. I use ERSST V4 as the ocean temperature data for TempLS. The actual form of he data is sometimes inconvenient; it probably wasn't intended for my kind of use. I described how it fits in here. My main complaint there was that it sets SST under sea ice to -1.8°C, which is obviously not useful as an air proxy. They obviously can't produce a good proxy, but it would be better to have the area explicitly masked, as you can't tell when the temperature is below about 1° whether it is really so, or whether there was part of the month that was frozen over, pulling down the average. I described last month a new process I use to get a more evenly distributed subset of the ERSST for processing. The native density of 2x2° is unbalanced relative to land, and biases the temperature toward marine. The new scheme works well, but it draws attention to another issue. ERSST seems to quote a temperature for any cell for which they have a reading, even if the cell is mostly land. And in the new scheme, cell centers can more easily be on land. In particular, one turned up in the English Midlands, just near where I was once told is the point at maximum distance from the sea. The ERSST filled cells are marked in pink; the land mask in lilac. The cells in green are both in ERSST and the land mask; white cells are in neither. You can switch the checkboxes top right to look at just ERSST, just mask, or just the green if you want. I called the green OVER, because it seems to mainly show sea intruding on land. There is a tendency for the green to appear on west coasts, which suggests that the ERSST might be misaligned. One annoying thing about ERSST is that they aren't explicit about wherther the coordinates given for a cell represent the center or a corner. I've assumed center. If you moved ERSST one degree west, the green would then appear, a little more profusely, on the East coasts. I used 60% sea as the cut-off for the lnd mask. This was a result of trial; 50% meant that the land mask tended tp fall short of the coast more than overshoot; 60% seemed to be the balance point. Either is pretty good. So my remedy has been to remove the green cells from the ERSST data. That seems to fix the problem. It raises anomalies very slightly, because it upweights land, but March rose from 0.89 to just 0.894, with similar rises in earlier months. The area involved is small. I am now looking at ways to landmask the triangular mesh. This is in a way a follow-up to the Easter Egg post. There I was showing the icosahedral based mesh with various flashing colors, with a background of transitions between spehrical harmonics (SH) to make an evolution. Taking away the visual effects and improving the resolution makes it, IMO, a good way of showing the whole family of spherical harmonics. I described those and how to calculate them here, with a visualisation as radial surfaces here. Just reviewing - the SH are the analogue of trig functions in 1D Fourier analysis. They are orthogonal with respect to integration on the sirface, and as with 1D Fourier, you can project any function onto a subspace spanned by a finite set of them - that is, a least squares fit. The fit has various uses. I use one regularly in my presentation of TempLS results, and each month I show how it compares with the later GISS plot (well). I also use it as an integration method; all but the first SH's exactly integrate to zero, so with a projection onto SH space, the first coefficient gives the integral. I think it is nearly as good as the triangle mesh integration. As with trig functions, the orthogonality occurs because they have oscillations that can't be brought into phase, but cancel. That is the main point of the pattern that I will show. There are two integer parameters, L and M, with 0≤M≤L. Broadly, L represents the total number of oscillations, some in latitude and some around the longitude, and M represents how they are divided. With M=0, the SH is a function of latitude only, and with M=L, of longitude only (in fact, a trig function sin(M*φ)). Otherwise there is an array of peaks and dips. This is a Very Serious Post. Really. It's a follow-up to my previous post about icosahedral tesselation of the sphere (Earth). The idea is to divide the Earth as best possible into equal equilateral triangles. It's an extension of the cubed sphere that I use for gridding in TempLS. The next step is to subdivide the 20 equilateral triangles from the icosahedron in triangles and project that onto the sphere. This creates some distortion near the vertices, but less than for the cube. So I did it. But not having an immediate scientific use for it, and having some time at Easter, I started playing with some WebGL tricks. So here is the mesh (each triangle divided into 49) with some color features, including some spherical harmonics counterpoint. Naturally, you can move it around, and there are some controls. Step is the amount of color change per step, speed is frame speed, and drift is the speed of evolution of the pattern. It's using a hacked version of the WebGL facility. Here it is. Happy Easter. GISS March up by 0.02°C, now 1.12°C! 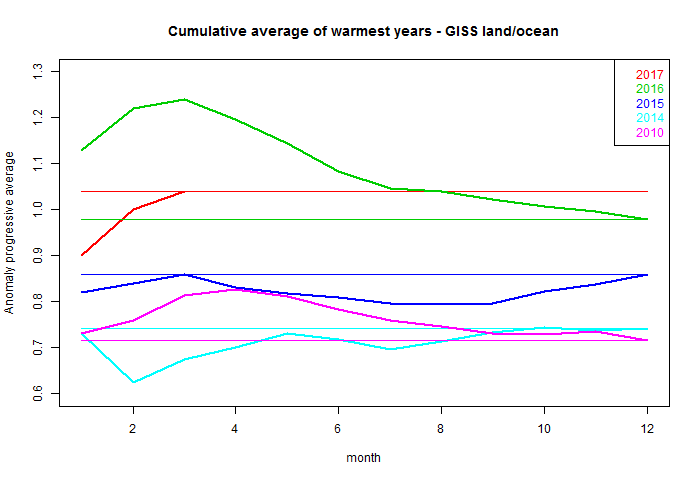 As Olof noted, GISS has posted on March temperature. It was 1.12°C, up by 0.02°C from February. That rise is close to the 0.03°C shown by TempLS mesh. It makes March also a very warm month indeed. It's the second warmest March in the record - Mar 2016 was near the peak of the El Nino. And it exceeds any month before 2016. Here is the cumulative average plot for recent warm years. Although 2016 was much warmer at the start, the average for 2017 so far is 0.06°C higher than for all 2016. I'll show the globe plot below the jump. It shows the huge warmth in Siberia, and most of N America except NW. And also Australia - yes, it has been a very warm autumn here so far (mostly). GISS escaped the China glitch. 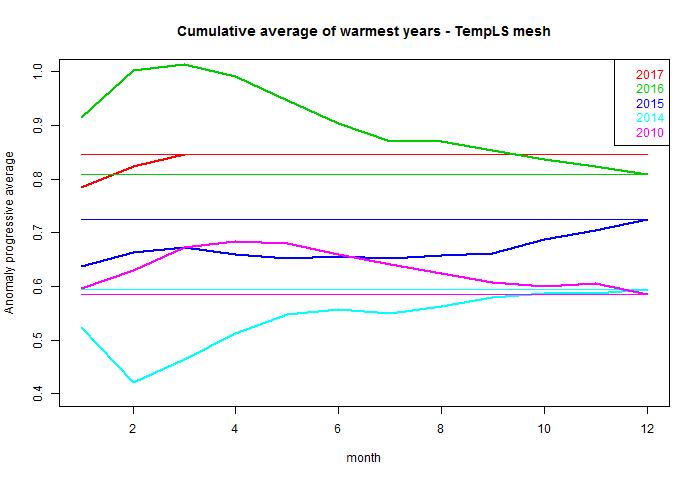 Commenter Olof R noticed that the TempLS mesh estimate for March had suddenly risen, reversing the previously reported drop of about 0.06°C to a rise of 0.03°C. He attributed the rise to a change in China data, which, as noted in the previous post had been very cold, and was now neutral. I suspected that the original data supplied by China might have been for February, a relatively common occurrence. Unfortunately when I download GHCN data it overwrites the previous, so I can't check directly. But the GHCN MAX and MIN data are updated at source less frequently than TAVG, and they are currently as of 8 April. So I checked the China data there, and yes, March was very similar to February, though not identical. GHCN does a check for exact repetition. Then I checked the CLIMAT forms at OGIMET. I checked the first location, HAILAR (way up in Manchuria). The current CLIMAT has a TMAX of -3°C for March and -13.5°C for Feb, and yes, the 8 Apr GHCN has -13.5. So it seems that is what happened, and has been corrected. So March is warmer than February, and so warmer than any month before Oct 2015. It is also warmer than the record annual average of 2016, and so then is the average for Q1 of 2017. The result is fairly consistent with the NCEP/NCAR average, which showed a very slight fall. I was preparing a progress plot for the next GISS report, so I'll show that for TempLS. It shows the cumulative average for each year, and the annual average as a straight line. 2017 has not started with the El Nino rush of 2016, but is ahead of the average and seems more likely to increase than decrease. This post is basically an exercise in using the WebGL facility, with colorful results. It's also the start of some new methods, hopefully. I wrote a while ago about improved gridding methods for integrating surface temperatures. The improvement was basically a scheme for estimating missing cells based on neighbors, and an important enabling feature was a grid that had more uniform cells than the conventional lat/lon grid. I used a cubed sphere - a projection of a gridded cube surface onto the sphere. The corners of the cube are a slight irregularity, that can be mitigated by non-linear scaling of the grid spacing. The cubed sphere has become popular lately - GFDL use it for their GCMs. It worked well for me. In that earlier post, Victor Venema suggested using an icosahedron instead. This has less irregularity at the vertices, since the solid angle is greater, and the distortion of mapping to a sphere less. The geometry is a bit less familiar than the cube, but quite manageable. A few days ago, I described methods now built into the facility for mapping triangles that occur in convex hull meshing actually onto the spherical surface. This is basically what is needed to make a finer icosahedral mesh. In this post, I'll use that as provided, but won't do the subdivision - that is for another post. I also wanted to try another capability. The basic requirement of the facility is that you supply a set of nodes, nodal values (for shading), and links which are a set of pointers to the nodes and declare triangles, line segments etc. From that comes continuous shading, which is usually what is wanted. But WebGL does triangles individually, and you can color them independently. You just regard the nodes of reach triangle as being coincident with others, but having independent values. For the WebGL facility, that means that for each triangle you give a separate copy of the nodal coordinates and a separate corresponding value, and the links point to the appropriate version of the node. March global surface temperature down 0.066C. TempLS mesh declined in March, from 0.861°C to 0.795°C. This follows the very small drop of 0.01°C in the NCEP/NCAR index, and larger falls in the satellite indices. The March temperature was still warm, however. It was higher than January (just) and higher than any month before October 2015. And the mean for the first quarter at 0.813°C is just above the record high annual mean of 0.809°C, though it could easily drop below (or rise further) with late data. So far all the major countries seem to have reported. With that high Q1 mean, a record high in 2017 is certainly possible. The breakdown plot is remarkable enough that I'll show that too here (it's always on the regular report). On land almost all the positive contribution came from Siberia and Arctic - without that, it would have been quite a steep fall. SST has been slowly rising since December, which is another suggestion of a record year possibility. Incidentally I'm now using the finer and more regular SST mesh I described here. The effect on results is generally small, of order 0.01-02°C either way, which is similar to the amount of drift seen in late data coming in. You may notice small differences in comparing old and new. You'll notice quite a big change in the number of stations reporting, which is due to the greater number of SST. I've set a new minimum for display at 5300 stations. In the early days of this blog, I took up a challenge of the time, and calculated a global average temperature using just 60 land stations. The stations could be selected for long records, rural etc. It has been a post that people frequently come back to. I am a little embarrassed now, because I used the plain grid version of the TEmpLS of the day, and so it really didn't do area weighting properly at all. Still, it gave a pretty good result. Technology and TempLS_ has advanced, I next tried using triangular mesh with proper Voronoi cells (I wouldn't bother now). I couldn't display it very well, but the results were arguably better. Then, about 3 years ago, I was finally able to display the results with WebGL That was mainly a graphic post. Now I'd like to show some more WebGL graphics, but I think the more interesting part may be tracking the coverage uncertainty, which of course grows. I have described here and earlier some ways of estimating coverage uncertainty, different from the usual ways involving reanalysis. This is another way which I think is quite informative. 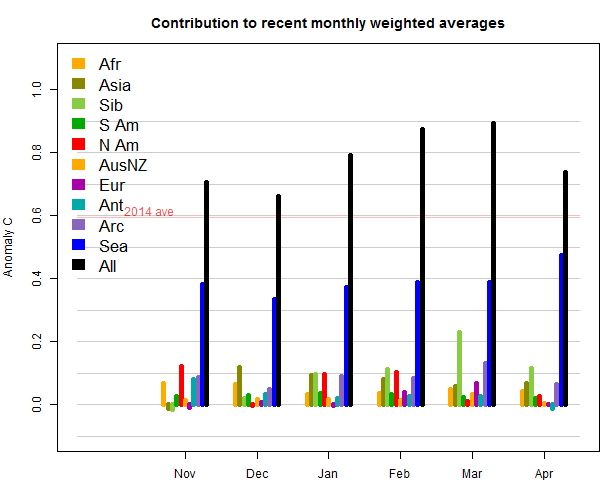 I start with a standard meshed result for a particular month (Jan 2014), which had 4758 nodes, about half SST. I get the area weights as used in TempLS mesh. This assigns weight to each nodes according to the area of the triangles it is part of. Then I start culling, removing the lowest weights first. My culling aims to remove 10% of nodes with each step, getting down to 60 nodes after about 40 steps. But I introduce a random element by setting a weight cut at about 12.5%, and then selecting 4/5 of those at random. After culling, I re-mesh, so the weights of many nodes change. The rather small randomness in node selection has a big effect on randomising the mesh process. And so I proceed, calculating the new average temperature at each step from the existing anomalies. I don't do a re-fitting of temperature; this is just an integration of an existing field. I do this 100 times, so I can get an idea of the variability of temperature as culling proceeds. Then, as a variant, I select for culling with a combination of area and a penalty for SST. The idea is to gradually remove all ocean values, and end up with just 60 land stations to represent the Earth. 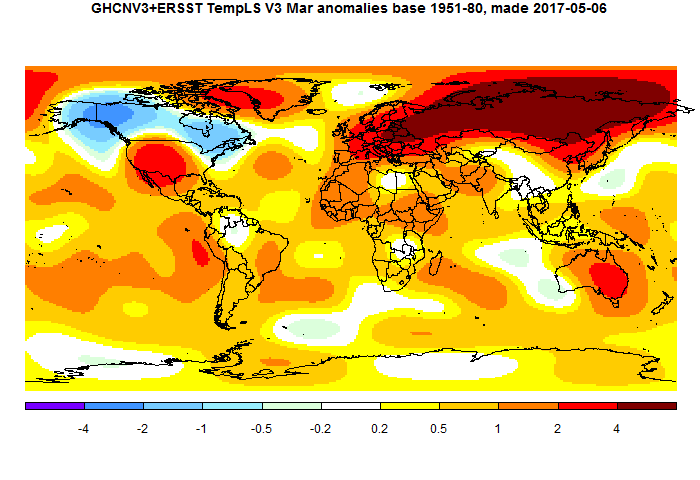 The NCEP/NCAR anomaly for March was 0.566°C, almost the same as Feb 0.576°C. And that is very warm. It makes the average for the first quarter 0.543°C, compared with the 2016 annual average of 0.531°C. In most indices, 2016 was the warmest ever, so with a prospect of El Nino activity later in the year, 2017 could well be the fourth record year in a row. You can bring up the map for the month here. It was warm in Europe, mixed in N America, warm in Siberia but cool further South, and varied at the poles. So GISS may come down a bit, since it has been buoyed by the Arctic warmth.